Discussion in 'iPhone' started by chrissmash, May 5, 2015. I currently have an iPhone 5S which I intended on selling to buy the iPhone 6 when it came out, sadly I hesitated and now I find myself mid-cycle. I have heard users complain about the iPhone 6 plus and friends complain about the iPhone 6 wishing they had bought a 6 plus. 1) Wait for the next generation of iPhone to be released presumably 6S in Sept/Oct. 2) Sell the iPhone 5S while it still has a little value and pick up an iPhone 6. 3) Go for an iPhone 6 Plus and don't look back. Keep your 5S and wait for the 6s/6s+ to come out around September this year. If you're considering a 6+ because of the better battery and that your friends wished they had gone with the 6+, you may be one of those that end up returning their phone for a 6. Anyways, I think you should keep your 5S and wait for a 6S. The 5S is still a peppy phone, and September isn't too far away. It all really depends on which one of those options appeals more to you personally. Personally, I don't like buying phones mid-cycle. Then again, I don't really worry about resale value since my old phones tend to get passed down to family members. Wait 4 months and get the 6s. In the Android world we were eased into the larger format phones as they got steadily larger. I'm only guessing but going from a 5s to a 6 plus will be a shock. Sorta like the shock I got when I did the T Mobile test drive of 5s while owning a Note 3. I was glad I was using the phone only to test T Mobile's coverage. I could never own it because I couldn't read anything on it. I would imagine the same will be true in reverse though the reasons will be different. The 6 would likely be a better fit. Battery life-wise I don't know how the 5s compares to the 6. I went from a Note 3 to a 6 Plus and it was an easy transition. However, if Apple had offered a 5 inch phone, I would have given it serious consideration. I know 2 people who owned Note 2s for a couple years. One changed to a Nexus 5, the other to an iPhone 6. Went from 5 to 6 and it really wasn't anything close to a shock at all. The plus would likely be more of a noticeable difference. I do think the 6 is meant as a transition phone from the 5s. The plus would be a huge difference. I feel that going from a 5s to a 6+ causes cardiac arrest. You most likely will think its too big. As stated I too transitioned over to larger screens via android. I understand your wanting of a 6+ but I think you should get the 6 with the intention of moving to the 6s+ when it arrives. This will give you time to adjust to the size of the 6 and by the time the 6s+ is out you will want the larger screen. By that time you will have adjusted to a bigger phone. TBO you really have to adjust to the size of these larger phones. Its things like will it fit in your pocket, will it fit in your cup holder in your car (mine didn't so I got a new car LOL (not really)), is it too heavy, can you hold it in your hand, does it hurt your pinkie finger, can you text with one hand? Those are the problems people face with larger phones. I went from a 5 to a 6+ and the difference is pretty shocking. It isn't so much the size as the weight, the 6+ is a heavy beast. I was doing some maintenance on my mum's Galaxy S3 last night and the size/weight difference really made my 6+ seem huge again. I do think that a 5" screen size is optimum and would like to drop down from my supersized 6+ with my next upgrade. However, the 4.7" iPhone is just too small. Why do they make one small phone and one supersized? How about the sweet spot Apple? I would hold on to your 5s and wait for the 6s. Unless your 5s is really giving you trouble, I don't see a reason to upgrade at this point (unless you want the bigger screen and/or Apple Pay). I really agree with you on this one. I've was just holding my 6+ thinking that it really is a big phone. I bought the 6 at launch and the 6+ in Jan. Now that the weather is changing I may carry my 6 for the summer. Having owned the Plus for awhile now, I would stick with the 4.7 phone at next upgrade. I really don't need a large phone on a day to day basis. It just seemed exciting after seeing it those months after launch. I agree a 5 inch phone would be the perfect compromise between the two. So OP, you really need to make that decision based on your needs. Hold them both as much as you can if possible. The battery is great but there really is a difference in size/comfort. But I would wait for the s model at this point. This, for sure. My wrist actually gets sore when I've been using the phone for too long. As to your original question, I say wait until the next phone update. Between the 5S and 6 you really aren't missing out on much other than size and Apple Pay (irrelevant if you have an Apple Watch). I would agree with you a 6S right in the sweet spot would be perfect. Thanks for the replies guys, I think I will wait to see what goodies are announced in September. The 5S is doing nicely at the moment and gives me a little while to save up too! I say go 6 plus. It's awesome. I say get the 6S Plus. The current plus apparently has lack of RAM issues, as does the 6 but it isn't as bad. Also, the same A8 chip that's in the iPhone 6 is powering a much higher resolution display, so some have reported performance issues. Nothing major in my opinion but still something to consider. This all may be resolved with the 6S series. You also said the longer battery life would be appealing, that's one thing you would regret with the 6. It'd be "Well, the 6 is nice and all but I really would like to have that battery life with the 6 Plus." With your friends around you having a 6 Plus that would probably spark more envy of that big screen, resulting in a return of the 6. Landscape features would also be kinda cool, as well as the improved camera. But yeah, wait for the 6S, I'm thinking you're leaning for the Plus, so that's what I'm suggesting. 6S Plus for you. Thanks for your response, you would be correct I am leaning towards the 6 plus so the 6S plus would be the winner here. Thanks everyone, you helped make my mind up! Terrific work! The 6 plus is the best mobile phone ever created. I have used over 50 smartphones including many Android devices and all iPhones. Sure it's large, but it is much easier to read articles, text, play games, watch videos, and pretty much do anything an iPad can do all while being with you at all times. I loved my iPad Air 2 but since getting a 6 plus, I have used it one time. The 6+ is definitely a full entertainment device. At this point in the cycle, I would wait for the 6S+ or whatever they will call it. Some people hate the large phone but once you get used to it, it's absolutely amazing. Get the 6 plus. Battery is amazing and screen is too. The 6 is to small. After having the 6 plus you will never look back. The 6 is too small but then the 6+ is too large. Neither is spot on. As for the battery, I don't call scraping 10 hours of use amazing. Good yes, but another two or three hours would be nice. The standard i6 should be getting 10 hours by now if Apple wasn't so into the thin thing. After staring at an iPad all day, even grabbing a 6 Plus feels "small" or "just right for mobile." Also what is mid-cycle??? You either have enough money to sell and buy the newest every year or you wait 2 years. You're already behind, why do you care, you don't seem to care anyway. Its more about you, the pleasure you get using it day to day. Its a delight to use it so what about the value of you losing half a year of your life using a tiny phone when you could be using an iPhone 6 plus these months?? Thats what matters. Not the market. Then if you want sell it (if you kept it in a case) and buy the new one when you have a few hundred bucks extra at any point in the cycle again. its not about the cycle its about you spending as many months with a more delicious device. My iPhone 5 sometimes I feel like is on it's last legs, I don't know if doing a whole restore from 8.3 would help out a lot, already saving for an iPhone 6S, going to max it out 128GB. I can wait till Sept./Oct. I have had a 5s for about a year and a half and am very happy with it. 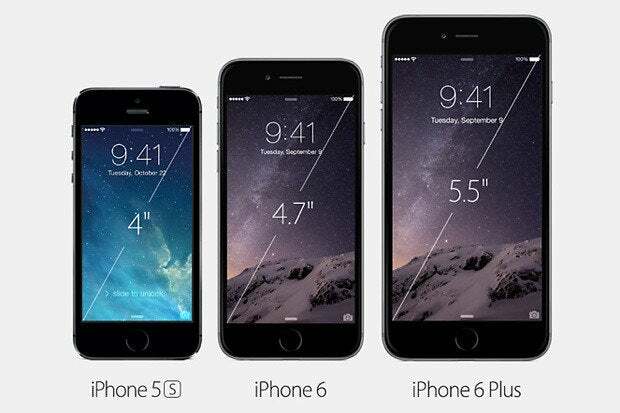 But the 6 plus looks interesting to me. Really, I don't talk much on the phone and unless I'm travelling just don't use my phone all that often. The idea of having a small tablet that could also make phone calls is appealing though. For me, the iPhone 6 would be "neither here nor there", I might as well just keep my 5s. But the 6 plus would open up some new uses with the larger screen. I'm just not sure if it would be worth the trade-off of carrying around a bigger device. I balked a bit about upgrading from my iPhone 4 to the 5s due to the increased size, but really it hasn't been a problem. Not any any hurry to upgrade though, it never even crossed my mind until a friend from Europe asked if I was interested in selling my phone. That started me thinking about the 6 plus, but I haven't even played with one in person yet. Guess I need to spend some time with one in the store and see how it suits me. Then how come my mom went from the 4s to the 6+ and she didn't get cardiac arrest?